Everything the Grill Master needs in one innovative tool; fork, spatula, silicone marinade brush, bottle opener and corkscrew. This rosewood handled tool divides into 2 parts when using then folds back into the handle and locks together for easy carrying making BBQ activities more fun, easy and convenient. Packed in a 2 piece matt black gift box. Size 295 x 90 x 25 mm. Brand Engrave, Pad, Screen. Print 60 x 15 mm. 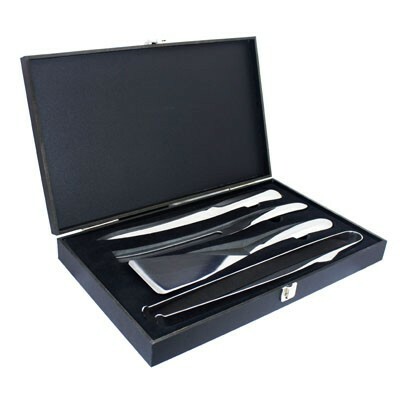 Beautifully crafted 4 piece stainless steel BBQ set - knife, fork, tongs, spatula, with modern contoured handles presented in a wooden black box. 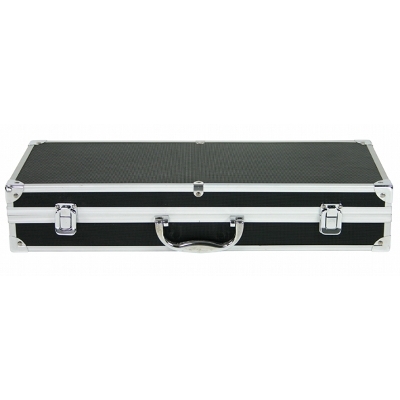 Includes an optional stainless steel branding plate that can be fixed to the outside of the box for easy of branding. A multi-purpose 600D Polyester and aluminium hamper. 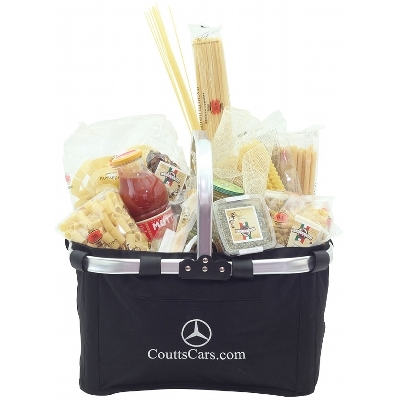 Use to carry all your picnic goodies, as a gift hamper or as a tote for shopping. Conveniently folds up when not in use. Size: 43 x 27 x 23cm Colour: Black. Decoration Option: Screen Print. Decoration Area: 130 x 100mm. 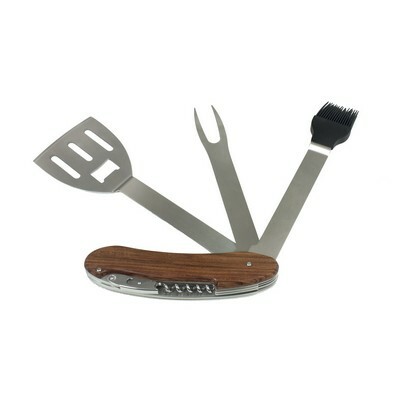 4pc stainless steel BBQ tools with wooden handles. 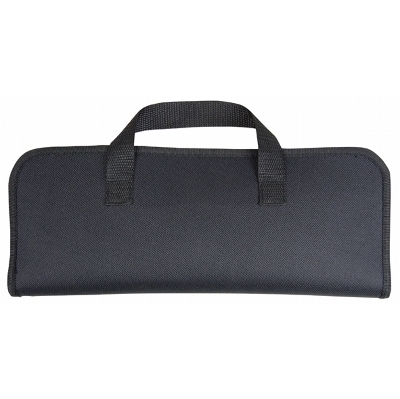 Packed in a black 1000D polyester zipped carry pouch. Gloss black gift box. Size: 370 x 145 x 30mm Colour: Black. Decoration Option: Screen Print. Decoration Area: 80 x 100mm. 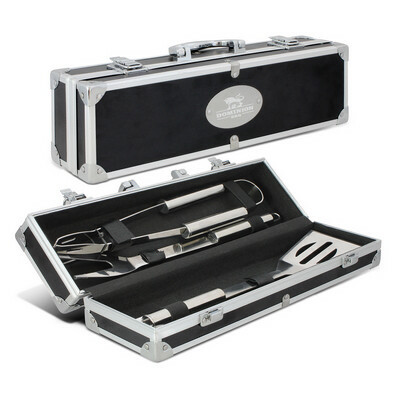 12pc Stainless Steel BBQ tools in smart black aluminium case, includes separate self adhesive stainless steel plate for branding. Size: 470 x 185 x 86 Colour: Black. Decoration Option: Engrave. Decoration Area: 70 x 35mm. Take this 600D polyester bag to the beach or the park and you will have your BBQ and tools neat at hand. 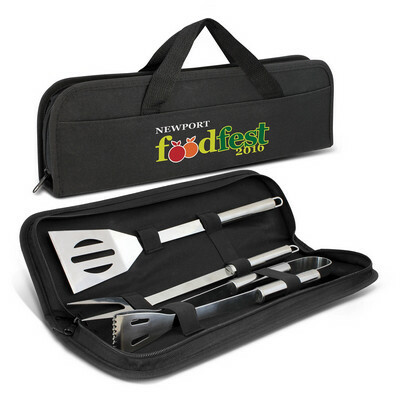 The foldable BBQ is made of sturdy steel, the utensils of stainless steel with black wooden handles. Size: 330 x 65 x 360 (folded) Colour: Black. Decoration Option: Screen Print. Decoration Area: 230 x 190mm.